The Muppets didn’t disappear after 1999’s Muppets From Space, their last big-screen feature, but it started to seem that way after a while. Sure, there were TV movies and the occasional special, but it felt like the Muppets had started to move to the far margins of pop culture as they became a relic of one of its past ages. The Muppets, a new feature film starring the characters, not only acknowledges their fade from relevance, it bases the entire film around it. 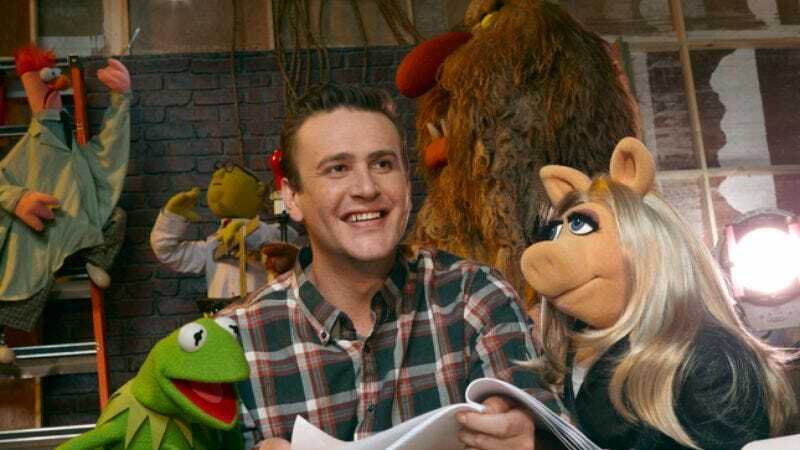 Co-written by star Jason Segel and Forgetting Sarah Marshall director Nicholas Stoller, The Muppets takes place in a world that’s dropped the Muppets in favor of garish, violent kids’ programs like Punch Teacher, which is just what it sounds like. The Muppets themselves haven’t helped. For reasons never fully explained, they’ve disbanded, leaving the studio lot that once housed The Muppet Show to fall into ruin, and the world of entertainment poorer for their absence. The self-aware conceit is clever at first, but grows tedious as the film dwells on it. When Segel, his brother Walter (a Muppet raised in a human family, and obsessed with The Muppet Show), and Segel’s girlfriend (Amy Adams) travel to Los Angeles, they find the Muppet kingdom in disarray. After learning that an evil oilman (Chris Cooper) has designs on destroying what remains of the Muppets’ home base, they seek out Kermit The Frog and convince him to reunite the old gang. Much of what follows moons over what a shame it is that everyone has forgotten the Muppets, and how great it would be if the Muppets were stars again. The film tugs hard at the heartstrings of nostalgia-prone viewers who grew up with Jim Henson’s characters, while often forgetting that it needs to make a case for why we should still care about the Muppets. Any kids seeing Kermit and friends for the first time here might wonder why the little felt things act so sad all the time. Fortunately, when The Muppets remembers it’s supposed to be funny, it makes a pretty good case for its stars’ continued relevance. Frank Oz opted not to step out of voiceover retirement for the project, and shortly before its release, he groused about the script not staying true to the Muppet spirit. Long the voice and puppeteer for Fozzie, Miss Piggy, and others, Oz is missed, but the film finds the Muppets’ heart without him. The Muppet Show and the early Muppet films harnessed an unlikely combination of irreverence and winsomeness. Henson’s characters maintained an essential innocence while sending up the very idea of entertainment. They put on a show with quotation marks around it, but the irony never felt cynical. When it isn’t getting bogged down in unearned sentiment, The Muppets gets that right. The songs, largely written by Flight Of The Conchords’ Bret McKenzie, are cute and clever, and the gags are witty, from a group of low-life Muppet rip-offs called The Moopets to Kermit’s 1980s-vintage robot manservant, who’s always happy to serve up a Tab or a can of New Coke. And even when it gets bogged down in angst and misconceived moments—a Muppetized take on “We Built This City” belongs on the cutting-room floor—The Muppets remains fundamentally likeable. It does star Muppets, after all. Now, having reassured one generation that there’s still life in the funny animals that entertained them as kids, it might be time to make some memories for the next generation to feel nostalgic about in the future.